R&B and hip hop icon Lauryn Hill is back! 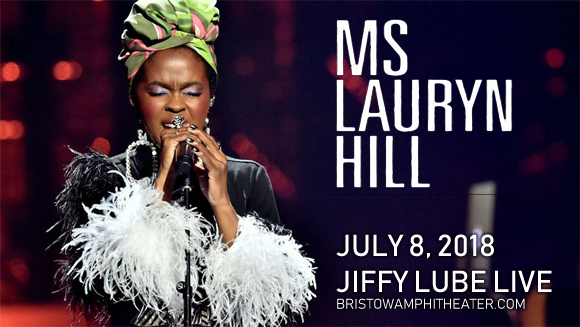 The legendary artist will be performing at Jiffy Lube Live on Sunday 8th July 2018 and for her first headlining tour in many years, the incredible Ms Hill will be performing her unparalleled album The Miseducation Of Lauryn Hill in full! Celebrating the 20th anniversary of a record that has influenced a whole generation of hip hop and R&B artists, this will be a very special show! Tickets available now! One of the originators of the neo soul genre and a prominent figure in 1990s hip hop, American singer, songwriter, rapper, record producer and actress Lauryn Hill first came to public attention as Whoopi Goldberg's co-star of the 1993 film Sister Act 2: Back In The Habit. Meanwhile, Hill was also part of the hip hop group the Fugees, who signed with Columbia/Ruffhouse Records that same year. The band's second studio album, The Score (1996), was both a critical and commercial hit, selling over 17 million copies worldwide and winning a Grammy Award for Best Rap Album, as well as launching their breakout hit, a rendition of “Killing Me Softly”, which won the Grammy Award for Best R&B Performance by a Duo or Group with Vocals. In 1998, Hill released The Miseducation Of Lauryn Hill, her first and only solo studio album. The album, which featured the singles "Doo Wop (That Thing)", "Ex-Factor" and "Everything Is Everything", debuted at number one on the Billboard 200 and earned her a record-breaking ten nominations and five awards at the 41st Grammy Awards, including Album of the Year, Best R&B Album, Best R&B Song, Best Female R&B Vocal Performance, and Best New Artist.